The Adirondack or Muskoka chair is an all time favourite for anyone with the luxury of a terrace and a bit of a view. In America, one will find them in great abundance in rural, outdoor settings and city porches alike. The original design of today’s chairs was drawn by Thomas Lee in 1903. He was on vacation in Westport, New York, in the heart of the Adirondack Mountains, and needed outdoor chairs for his summer home. He tested the first designs on his family who loved the comfort of his design. A local carpenter friend gladly produced a few for him. This friend, a certain Mr. Bunnell realized the chair was the perfect item to sell to Westport’s wealthy summer residents, and without asking Lee’s permission, Bunnell filed for and received patent 794,777 in 1905. 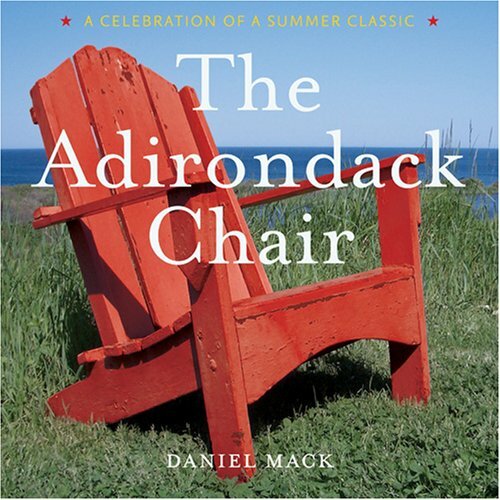 The original Adirondack chair was made off eleven planks and pieces of wood. It had a straight back and seat, which were set at a slant to sit better on the steep and sloping mountain inclines of the area. It also featured wide armrests, which became a hallmark of the Adirondack chair. Today’s Adirondack chairs usually feature a rounded back and contoured seat as this is considered a bit more comfortable. Adirondack chairs are becoming popular as outdoor seating at cafés and bars because the flat armrests are suitable for setting food and beverages on, making it possible to provide individual seating without tables. Homevoyeurs.com’s webshop sells a great book about the chair with many inspiring photographs. At a mere $14.00 it works as a great coffee table book or present. Buy it here. If you want your own chair, Google for instructions to make your own of for nearby retailers. They are sold all over the world. This entry was posted in Design, designers and online finds, Products from the Homevoyeurs.com webshop. Bookmark the permalink.